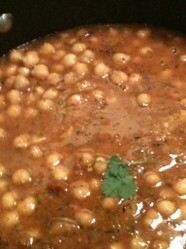 Tasty Recipe for Chole, and Indian Chick Peas (Garbanzo Beans) Dish. Most people in India are vegetarian. Lentils, other beans, and nuts are therefore common protein sources in Indian food. Here, I am showing a recipe for chole, which is an Indian dish made with the legume commonly known as chick peas or garbanzo beans. India is the largest producer of chick peas in the world. Chick peas are excellent sources of protein, fiber, folate, and manganese. They are also good sources of iron, magnesium, phosphorus, zinc, and copper. Garbanzo beans are also commonly used in certain middle-eastern cuisine, such as hummus and falafel. Laxmi Turmeric powder is used primarily in the preparation of many Indian and oriental dishes. 1. Place tomatoes into a heated pan (high or medium-high heat), and drizzle with a tablespoon of canola oil. 2. Let tomatoes blacken, turn tomatoes for even blackening on all sides. 3. When tomatoes are evenly roasted, add garlic and coarsely sliced onion, and continue to heat until the onions and garlic have browned, then shut off heat. 4. Put these roasted ingredients into the blender, tomatoes first. Add half bunch cilantro. 5. Blend on low setting for a few seconds, then high setting until you see an even texture. I use the Ninja professional blender. Tadka is the general term for the mixture of spices that gives most Indian dishes their characteristic flavor. 1. Pour 1/3 cup canola oil into a 6 quart pot and place on medium-high heat. 2. After giving the oil a few minutes to heat up, add cumin seeds, and allow them to brown for only a few seconds, then shut off the heat. 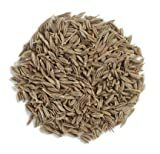 Keeping the heat too long here will burn the cumin seeds. 3. Add finely diced onion. Turn the heat back on medium-high heat, and stir periodically as you roast the onion. 4. Add turmeric, hing, chili powder, and chole masala. Allow this mixture to evenly brown, stirring continuously for a few seconds. 5. Add ginger, then pour in the tomato mixture from the blender. 6. Reduce heat to medium, and allow to simmer for 2 minutes. 7. Add salt and sugar. 1. Add the chick peas to the pot, and simmer on medium heat for 20 minutes, then on low heat for another 20 minutes. 2. Turn off heat, and garnish with the half bunch of chopped cilantro. 3. Serve with basmati rice. This dish serves 8-10 people. 4. You can also squeeze some lemon juice over the dish before serving. Vegetarian diet is more and more popular in recent years - for health, religions, or loving animals... No matter if you are vegetarian or not, this recipe would not disappoint you. Progresso Chick Peas are great as a stand alone side dish or can be used as a recipe ingredient.